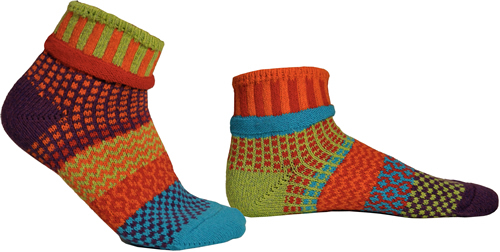 Marianne Wakerlin, the socklady is the founder and owner of Solmate Socks. 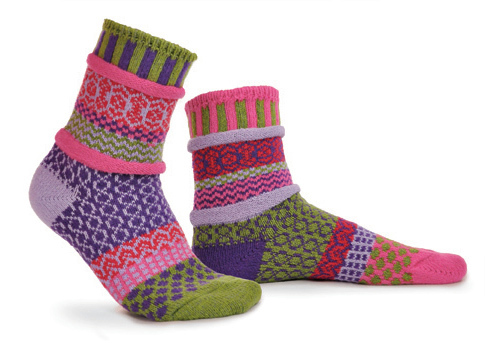 The company is named after her mom, Sunny, who taught Marianne how to knit when she was nine years old. 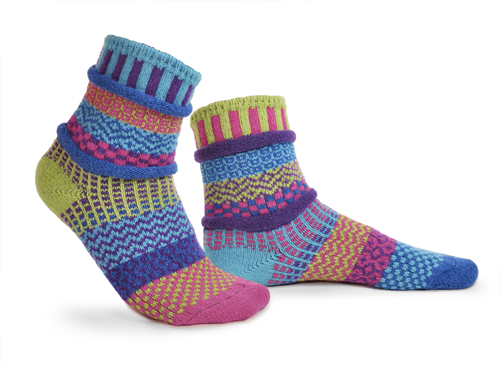 Marianne continued a life long enthusiasm for knitting, but it wasn't until she started knitting socks that her real passion was born. 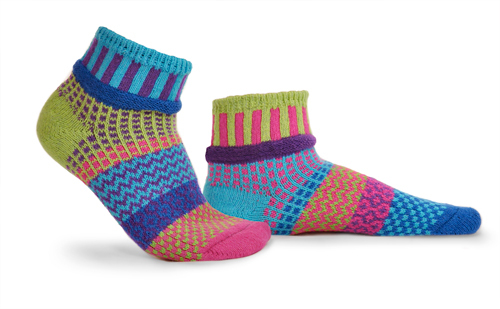 Her colorful and complex patterns are knit in the USA at a family owned knitting mill, hand finished and then "mismatched with care." 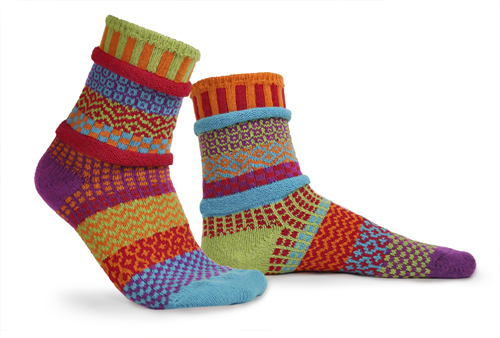 Solmate Socks are knit with pre-shrunk, color fast cotton yarns and all of our socks can be machine washed & dried. 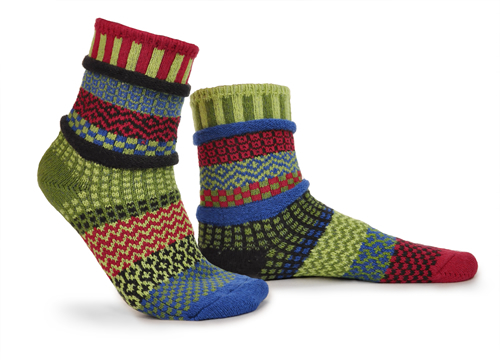 Socks will shrink a little in their first washing and are actually knit on the large side to accommodate this. The colors will not run or fade. 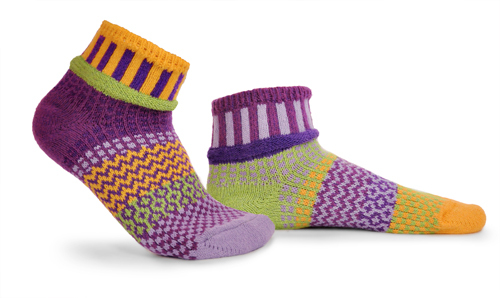 After several washings, stray ends of yarn may work themselves loose - you may clip these off or tuck them back into the sock. This is normal and the socks will not fall apart. 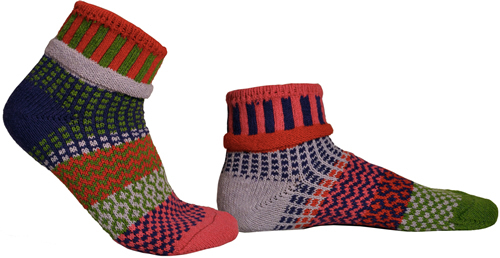 The socks are made of 80% cotton, 19% nylon and 1% Lycra. hyacinth $15. snapdragon $15. primrose $15. crocus $17. cosmos $17. bluebell $17.